I made some new playdoh for the kids this week (with the help of my hubby!). I would love to buy playdoh but Bee is allergic to wheat, which happens to be the main ingredient in playdoh. So, I’ve had to learn how to make my own gluten-free allergy-safe playdoh. It’s much cheaper too! Whisk together the flour, cream of tartar, and salt in a saucepan. In separate bowl stir together the water and the Kool Aid packet. Add the water/Kool Aid mixture to the saucepan along with the olive oil. Turn stove on medium heat and continue stirring until the mixture comes together in a ball. 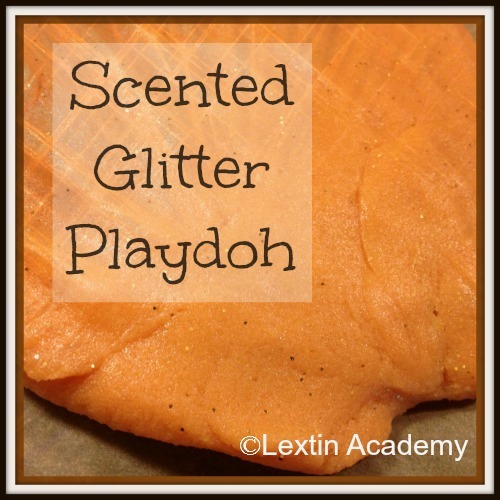 Scoop out playdoh and place on wax paper to cool. Sprinkle with glitter and knead the glitter into the dough. Store in airtight bags once it has completely cooled.